Vietnamese national TV channel VTV1 this morning confirmed that prisoner Cu Huy Ha Vu did not go on a hunger strike as rumored. 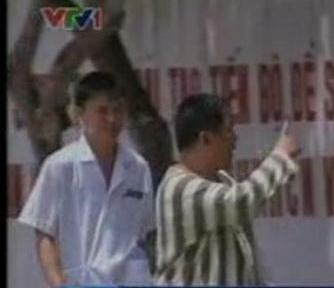 VTV1 aired a short clip showing Vu having a normal health and being examined by doctors. The channel said Vu “boycotted the prison’s meals” but ate food provided by his family. Regarding the rumor that he was mistreated in prison, Vu himself told the channel that he “does not know where the information started”, according to VTV1. Prison leaders in Thanh Hoa province where Vu is being held will recommend the Ministry of Public Security to investigate into the rumors. As previously reported, at the first instance trial in Hanoi in 2011, Vu was sentenced to 7 years imprisonment for “conducting propaganda against the State of the Socialist Republic of Vietnam” under Article 88, Section 1 of the Criminal Code.